Welcome to Roscoe, Illinois – To live here is to love it! Roscoe, Illinois is situated in Northern Winnebago County, just south of the Wisconsin border. We’re a growing community with compelling commitments to cultural, educational, healthy living and environmental values. With excellent schools, a low crime rate and beautiful natural parks, Roscoe is the perfect place for your business, family, and home. If you’re just moving in, please visit us at Roscoe Village Hall, 10631 Main St., or call us at (815) 623-2829. You may also contact us at info@villageofroscoe.com. Whether you contact us in person, by phone, or via e-mail, we are eager to assist you with any questions or concerns you may have regarding the Village of Roscoe and our many services, events and attractions. 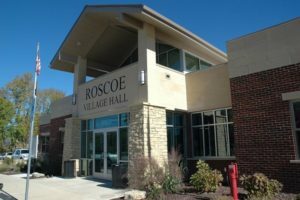 The Village of Roscoe is seeking applications from Village residents interested in serving on the Village’s Board of Fire and Police Commissioners to fill a vacancy. For more information click here. The Village of Roscoe is seeking applications from Village residents interested in serving on the Village’s Zoning Board of Appeals (ZBA) to fill a vacancy on the board. For more information click here.